For passionate offshore anglers, storing water onboard equates to greater weight, increased fuel burn and slower speeds chasing the bite. Savvy sportfish captains and owners now make their own water when at sea, for everything from drinking to washing down equipment. 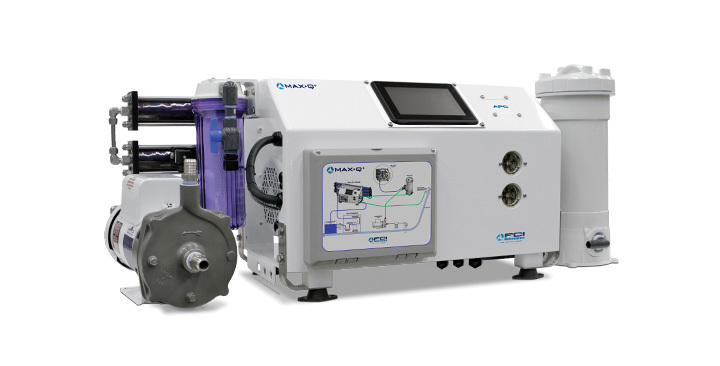 FCI Watermakers, leader in marine desalinization technology, offers the Max-Q+ APC as the ultimate watermaking solution for deep sea fishing. FCI Watermakers’ innovative Max-Q+ APC (Automated Pressure Control) will make up to 1,850 gallons of pure, sparkling-fresh water every day—automatically. With its advanced V-4 control, the watermaker is set-and-forget. It’s easily programmed using the intuitive interface on the 7″ touch screen display. It will start, make water, run diagnostics, shut down, flush itself and come back online—all while everyone’s on deck. Below decks on a sportfish boat should be a revitalizing retreat after a hard day fishing. The next-generation Max-Q+ APC is whisper-quiet due to its double vibration insulation, exceptionally smooth-running motors, and precision machining and assembly. The open frame design provides easy access for inspection and routine maintenance. For onboard spaces already filled with equipment, the unit is available in a modular configuration. FCI Watermakers builds all its products in the USA, using only the highest quality, non-proprietary components. This means if the boat is thousands of miles from its home port, disposables are all standard sizes and parts can be obtained locally. The company has a worldwide network of sales and service offices, spanning nearly 60 countries. No other watermaker offers as many certification marks. The Max-Q+ APC carries ABS, CE, GL Lloyd’s Register EMEA, Russian Maritime Register of Shipping and Det Norske Veritas registrations. Models are available that will make 700, 1,275 and 1,850 gallons per day, and all are compatible with FCI Watermakers’ line of Dockside Treatment Systems (DTS). The Max Q+ line starts at around $8,000.